Save The Date – The Sequel! Yes, like all good movie franchises we have a sequel too! 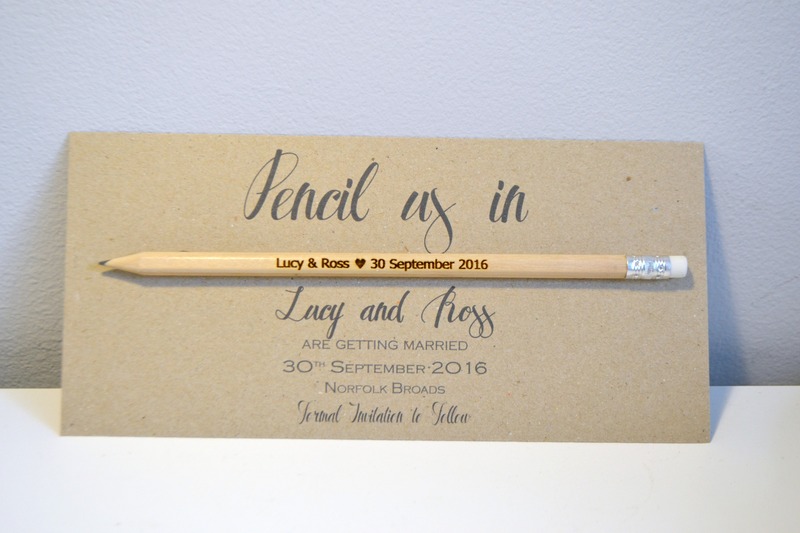 Following on from my last “when” to Save The Date we now have the “how” (I know, slightly less catchy than “The Empire Strikes Back” but still!) 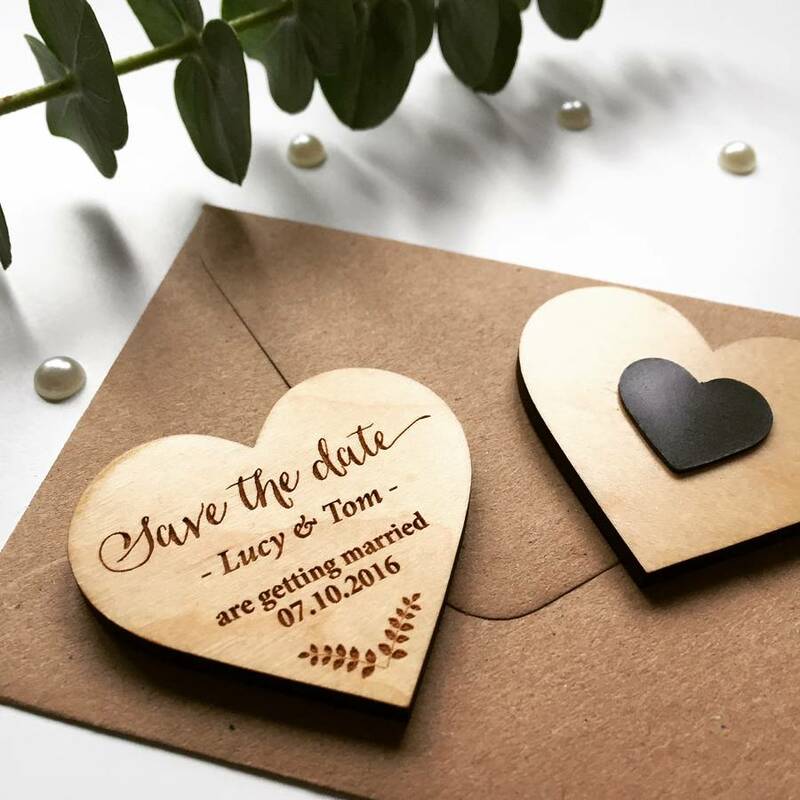 The great thing about Save The Date ideas is that this is your chance to really go wild and do something that is a total reflection of who you both are. A lot of your wedding decisions will end up encompassing other people’s wishes and dreams, so this is an opportunity to really showcase who you are as a couple. There are so many more ingenious ideas than the traditional cards (although there’s absolutely nothing wrong with going old school), so allow your imagination to run riot! A note of caution though, consider your guests a little before making a final decision. 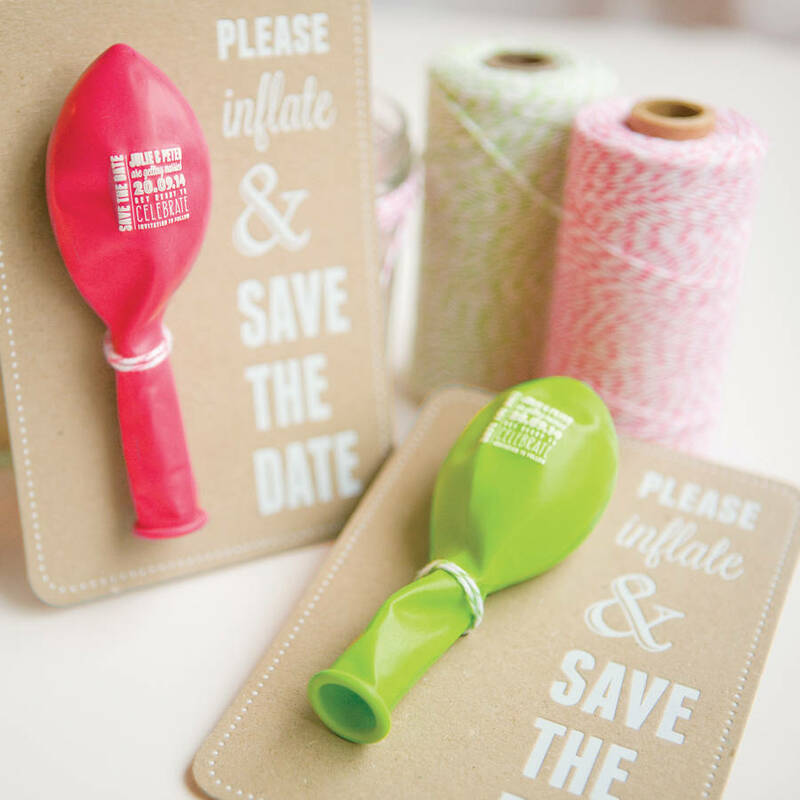 Yes, a miniature confetti cannon is a super cute idea, just not so much so for the 100 or so would be guests cursing you as they hoover it up!! And if you are planning on going down the arts and crafts route, that’s all well and good for the children in the bridal party but for the rest of us, while there’s still G & T’s to be drank, pizza to be eaten and Netflix to be watched, how many of us really want to spend that precious time building our own mini tepee with the date of your big day on it?! Cake!! I feel that this needs very little explanation or endorsement – it’s cake!! 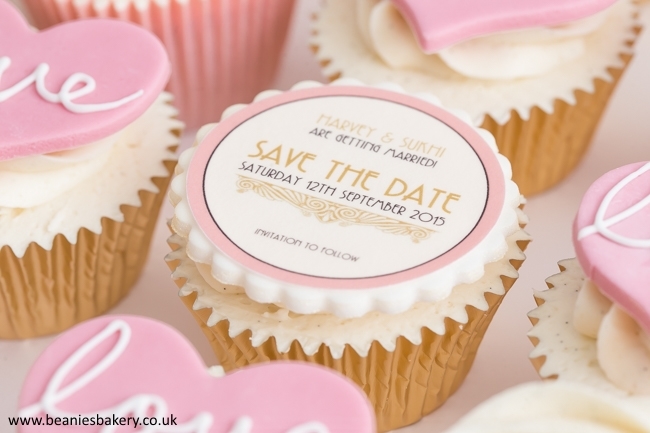 Everyone loves it and frankly, if they don’t, why on earth are you inviting someone who doesn’t like cake to your wedding?! You don’t need that kind of negativity in your life. The only drawback to this is well, I’d have eaten it before I’d have had the chance to read it! 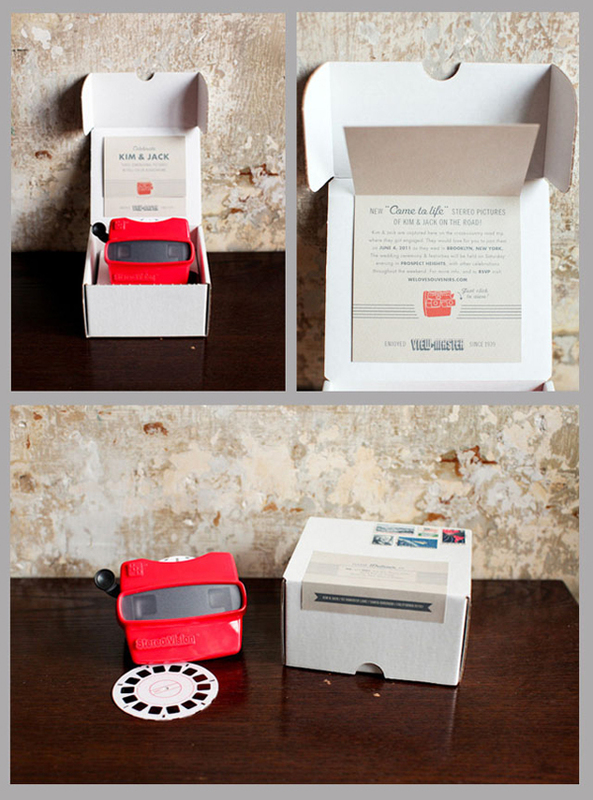 Slightly less thrifty than balloons but a total “Wow-never-seen-one-like-that-before-never-will-again” talking point is a Viewmaster Save The Date. Go retro and transport everyone back to the days when a penny sweet really did cost a penny and the latest advances in communication technology was a push button phone instead of a dial (question – what’s the modern day equivalent of twisting the phone cord around your fingers?!) Make a little story of the big day for everyone to click through and bask in the nostalgia of happy childhood memories at the same time. Also how much easier has buying Christmas and Birthday presents just become?! Ebay is now your best friend as you shamelessly exploit this for all its worth with festive gifts of reels of He-Man, Tom and Jerry, Thundercats etc…. Fridge magnets – what’s not to love! 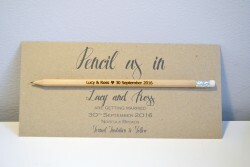 Simplistic, functional and a lovely keepsake. You can make them as personal as you like. My gorgeous cousin and his equally gorgeous bride to be recently presented me with one for their forthcoming wedding and I felt that it was a perfect representation of who they are as a couple: understated, elegant (pre family get together drinking session anyway!!) fun and somehow –much like they are – just right. There’s a lot of ideas here but if all this seems like too much effort, then this is what modern technology was invented for! Blast off a round-robin email which will take all of five minutes max to write, leaving you all the more time to settle down with your G & T, pizza and latest box-set on Netflix!